Byrne travels to Saskatoon for the 2018 PBR Canadian Finals ranked No. 19 in the national standings, 1839.99 points behind No. 1 Lachlan Richardson. Photo: Andy Watson/BullStockMedia.com. CALGARY, Alberta – Adversity. Trials. Tribulation. Hardship. Tragedy. Sorrow. Heartache. Those are just a few words that have been used to describe the burdens that Tanner Byrne has had to overcome the past two years. After finishing in No. 15 PBR world standings in 2016, competing alongside three fellow Canadians at the World Finals, the unthinkable happened on January 9, 2017 when Byrne’s best friend, Ty Pozzobon took his own life. When Byrne did make his way back into the arena to do his job after a month of grieving, things didn’t click. For the entire season. One injury after the other sidelined him for the majority of the year. He couldn’t win. Mentally, he was drained and his focus was elsewhere despite every effort in the world to get back on track. The start of the 2018 season marked a new chapter for Tanner Byrne, his brother, bullfighter Jesse Byrne was back and so was he. Injury exemptions allowed his return to New York City in January where he went 2-for-4 to finish inside the Top 15. 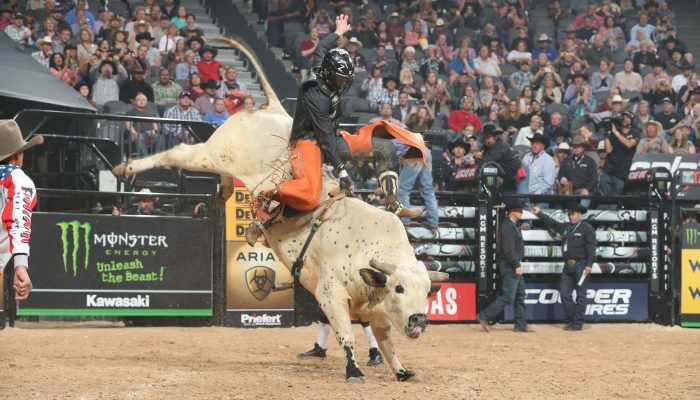 “With being injured and missing all the 2017 season and the injuries that I went through I honestly didn’t know if I still would have it in me with no groins and everything that broke and gave out on me, if I could still ride at that level,” Byrne said after his fourth appearance at the PBR World Finals in Las Vegas. “I got my confidence back winning St. Louis and getting back on tour obviously,” Byrne said of the February 2018 victory, his third at the elite level, the most to date by a Canadian. Byrne is one of the two most successful Canadian ever to set foot in the PBR with career earnings of $711,115 USD, second only to three-time PBR Canada Champion Aaron Roy. Roy’s career earnings could pass the $1,000,000 mark this weekend in Saskatoon, however, Byrne leads Roy in premier series victories, a milestone Roy has yet to achieve in his career. The fellow Saskatchewan product thought has eight World Finals qualifications, while Byrne has reached the most prestigious event in bull riding four times. “It was fun again, I enjoyed everything about going back to Vegas,” Byrne said of the 2018 PBR World Finals. “It was like my first time all over again. You get going to all those [UTB’s] and kinda take it for granted and that that’s just what you do, but when it all gets taken away from you and you don’t even realize how important it is and how special it is. At his fourth finals, Byrne went 2-for-6 to conclude the year No. 31 in the world standings, his fourth-best career finish to date. “I feel great, I went into the World Finals doing good, got a few rode, bucked off a few. All in all, it could have been better, it could have been a lot worse, but I feel like I had a good showing and can’t complain at all,” Byrne said. Coming out healthy after facing the best bulls in the world for five days was all Byrne could ask for. “A lot of injuries that go along with getting on that many bulls that many days in a row. It’s always a bonus when you can come out healthy,” Byrne said. “I’m healthy, I’m good to go. I’m back where I’m supposed to be, ready to roll for the 2019 season and we’ll kick it off in Saskatoon and keep going. 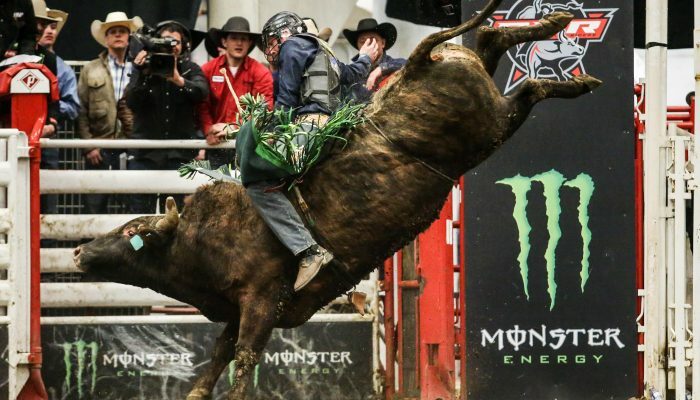 Saskatoon’s 2018 PBR Monster Energy Canadian Finals, presented by Mac’s/Circle K and Dakota Dunes Casino on November 23-24 will be Byrne’s ninth qualification and first event of 2019. “Saskatoon is one I always look forward to because I have to fly 20 to 30 hours a weekend and this time I get to drive one hour,” he laughed. “So it’s always one that I look forward to because it’s in Saskatoon. It’s only an hour, but it’s still a world class event that could contend with all the best events that I go to. Success there for Byrne includes the 2015 PBR Canada Championship. Speaking of showing ‘em what he’s got, Byrne will have a new baby to show off in Saskatoon after Ruby Wilder Byrne was born while he was at the World Finals. Being in Las Vegas at the World Finals during the birth of his second child was nerve-wracking. “It was crazy man, it was a pretty wild week,” Byrne said. “With not being there when Ruby was born, but it was pretty wild that with technology and FaceTime and all that sort of stuff worked so well that it was pretty much like I was there. It worked out pretty cool. I feel like I was more involved on this one even though I wasn’t even there. After living through and surviving a hellish 2017, 2018 has been better to Byrne. “I’m feeling good again, I’m healthy, I’ve got that confidence back in my body and I’m still able to do it through all the different stuff that’s went on the last little while,” Byrne said. “That’s a big thing in this sport is that confidence and I feel good about what I’m doing. I feel ready to ride and feel that I can take on the rankest bulls in the world again. With Dakota Buttar finishing No. 17 in the world, Lonnie West ranking No. 37 and Brock Radford ending the season No. 39, the Canadian contingent will be fully stocked in 2019 as well. “That makes it fun traveling down the road cause that’s really who you live with all the time, with my brother and stuff is those guys,” Byrne added of his brother Jesse who will also be in Saskatoon this weekend. “You don’t feel alone when you’re traveling with some of your best friends and fellow countrymen and stuff like that. I got no doubt in my mind that I’m coming into this season like I did when I was three years old and that was to be a world champion bull rider. All I can do is ride my bulls week in and week out. Stay on my bulls and let the chips fall where they fall. Despite West and Radford needing to overcome injuries and potentially being alternates, Byrne is confident they will be on tour. After the win in Yorkton, Saskatchewan, the first event on the 2019 calendar, Johnston ranked No. 1 in the PBR World Standings. “We’ve got a bunch of really good young guys coming up that I look forward to seeing,” Byrne said. “Like me and Ty and guys before us down there, they can see us have that success and I think that makes them want to go and do it and it gives them the confidence to go and do it. They are from the same place as us. It doesn’t really matter where you’re from, it’s about what you’ve got inside you. The 2018 PBR Monster Energy Canadian Finals, presented by Mac’s/Circle K and Dakota Dunes Casino begin on Friday, November 23 at 7:30 p.m. CST with Round 1 and Round 2. Tickets are still available and can be purchased at the SaskTel Centre Box Office, online at PBRCanada.com or Ticketmaster.ca, and by phone at 1-800-970-SEAT (7328). Fans purchasing a weekend package with tickets to both shows will receive a 15% discount. Fans will also be able to watch all the action LIVE on RidePass. The stream will begin on both Friday, November 23 and Saturday, November 24 at 7:30 p.m CT.
Ted Stovin is the creator of Everything Cowboy Inc., a hat maker with Smithbilt Hats, music director, event producer and writer.